At first, people browsed the web via cells occasionally, when there wasn’t a PC around (not good with the dates, but I think it was around 2004 - Nokia’s heyday). Then, the original smartphones came along, with bigger screens and apps, and lured about a third of PC Internet users. Finally, now, mobile exceeds PC web usage, and there are websites developed specifically for mobile gadgets. Things look grim for desktop devices and, if the progress trajectory doesn’t change, they might turn into just boring work tools, in the head of a common web users. While all the Internet fun - media content and shopping - people will do on mobile devices. 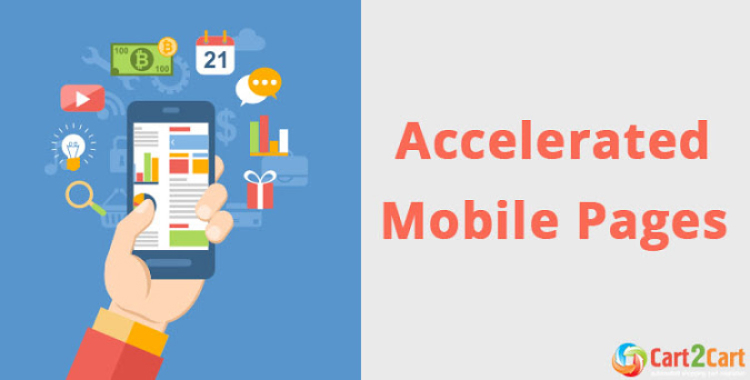 Trying prove ourselves and you that we’re relevant, and keep readers in the know, we’re posting an article about AMP (Accelerated Mobile Pages) today. We’ll describe what they are, what impact they have on e-Commerce sites, and your e-store in particular. The first and the main advantage is speed, the others - customers’ appreciation and SEO improvement, ensue from it. There is nothing web people loathe more than slow sites, and AMP HTML is expected get rid of them for good. According to Google AMP pages load 15 to 85% faster than regular ones. As for the SEO - we all know Google is all about mobile, sites that are correctly customized are cached quicker, and the more time users spend on your pages the higher your ranking you get. Thus, Accelerated Mobile Pages will soon become a must for anyone claiming top search engine list positions. Simplicity is a blessing and a curse when it comes to AMP. Yes, you get the fast load time, but all the complex code elements, everything that made your website look beautiful, advanced and unique is now gone. So, the suggestion is this: don’t adjust your entire site to the AMP coding standard, only the pages that are often updated and accessed from mobile devices, like blog and news sections, shopping cart and checkout pages. How do I start with implementing AMP? For non-WordPress sites, there is careful, diligent work included. Basically, you’ll have to find an AMP website and emulate it. Copy the way it is hard-coded, with variations suitable for you, or hire a specialist to figure it all out and get the modifications done. For store owners who sell on WooCommerce or WP eCommerce, and all WP users for that matter, everything is simpler, as usual. Get the AMP WordPress by Automattic and Yoast SEO plugins, install them, and the entire process of integrating AMP will be done in minutes. After implementing AMP, don’t expect immediate results, however. It’ll still take a few days before Google crawls your renewed content. So, what are your thoughts on AMP, will you be using it, or have your already implemented it and now are impressed with results? We’ll gladly read about your experience and opinion in the comment section. One thought on "What is AMP and Why Online Stores Should Use It"